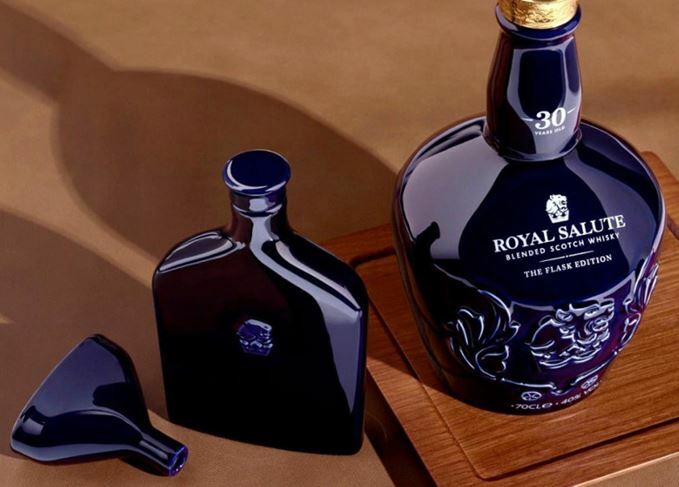 Blended Scotch whisky Royal Salute has joined forces with a London-based designer to create a limited release 30-year-old Flask Edition. The limited edition package includes a 30-year-old Royal Salute expression plus a porcelain flask, funnel and wooden serving tray designed by award-winning designer Afroditi Krassa. It is available to purchase from select high-end retailers globally for around US$790 (£620). Krassa took her inspiration for the packaging design from the crystalline glazing process, which is one of the ‘most ancient and elemental’ art forms. Peter Moore, global prestige brand director at Chivas Brothers, owner of Royal Salute, described the limited edition release as the ‘perfect travel accessory’ for those frequently on the move. It follows the launch of a new Royal Salute 21-year-old Polo Edition earlier this month, which is currently available in Singapore travel retail and set to launch globally in travel retail later this year. The 21-year-old blend features with smoky, salty notes inspired by the beachside sport. The new blend will launch in Singapore travel retail before a global roll-out later this year. The first of only 70 luxury Royal Salute bottles will be gifted to Prince Harry and Meghan Markle. Travel retail exclusive 32-year-old commemorates the accession to the throne of King James VI. The 28-year-old blend is designed to evoke the aromas of the palace’s kitchen gardens.